Yucatan has consolidated as an important destination and strategic point of air connection with the start-up of the Merida-Bajio flight and the routes that will soon come into operation towards Villahermosa, Chihuahua, Oaxaca, Hermosillo and Tijuana. During the session of the Consultative Council of the International Airport of this city “Manuel Crescencio Rejón”, the director of Regional Airports of Grupo Aeroportuario del Sureste (ASUR, for its acronym in Spanish), Hector Navarrete Muñoz, highlighted that the joint work between the state government and the airlines is reflected in the establishment of six new connections between different points of Mexico. He indicated that the recently inaugurated Merida-Bajio route, operated by the airline Volaris, not only allows the arrival of more tourists from the center of the country, but also serves as a direct link between the entity and the largest industrial corridor in Latin America. The executive recalled that on November 27, 2018, WestJet began the season of seasonal flights to the state capital of Yucatan, which runs until April 27, 2019, and is proof that Yucatan is appearing in the eyes of international tourists. Also, the airline VivaAerobus maintained its commitment to Yucatan by inaugurating the Mérida-Villahermosa route on the Dec. 15th, 2018, which takes off to the southeast Mexican city on Tuesdays and Saturdays, he added. Subsequently in March, Volaris will start operating flights to Chihuahua, Oaxaca, Hermosillo and Tijuana. The Mérida – Tijuana route becomes an end-to-end, Atlantic to Pacific coast flight that links the southeast with the northwest of the country. In addition, it opens the possibility for the Yucatecans to generate links with one of the most powerful economies in the world, such as the United States, through the cities of San Diego and Los Angeles, both in California. Navarrete Muñoz explained that another motivator for air transport companies to invest in the state has been the quality of infrastructure, security measures and the high level of staff training enjoyed by the Mérida International Airport, administered by ASUR. The above is proof that Mérida is not only a tourist destination, but that it is also heading towards its establishment as a strategic point for the attraction of national and foreign investments, as well as an area for the realization of Wrodl Class conventions. Governor Mauricio Vila Dosal led the meeting and received a commemorative medal from the regional director of ASUR for the 20 years of existence of the airport group. 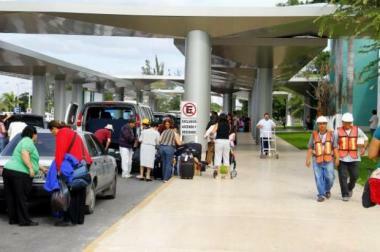 A report from the Mérida International Airport was presented to Vila Dosal, in which it was highlighted that from during 2018, more than 2.2 million passengers arrived at the “Manuel Crescencio Rejon”. In addition, it was noted that the opening of new routes to domestic and international destinations, together with existing ones, make up an offer of 14 destinations, through 12 airlines, which led to an increase of 14 percent in the arrival of passengers to this air terminal until November 2018, compared to the same period in 2017.